Heddon Street is close to Piccadilly Circus on the Piccadilly line, just 6 minutes walk away, Oxford Circus on the Victoria line is also just 7 minutes walk from the restaurant. There are frequent bus routes found on Regent Street close to where we are located. Based on the old style drinking houses of Japan known as izakayas. A place to unwind and relax in the company of great food, drink and friends. Serving casual authentic izakaya style food from Japan, our menu is designed to be shared with the table. 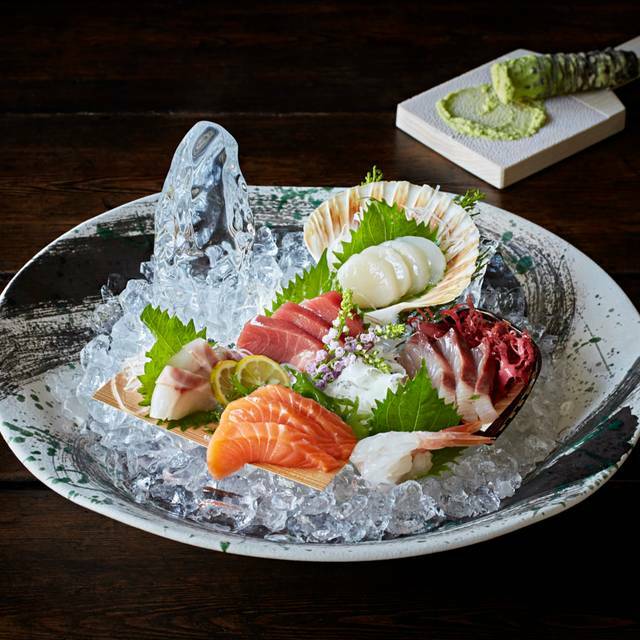 Our small bites range from fresh sushi and sashimi to light crispy tempura and hot charcoal grilled robata skewers. 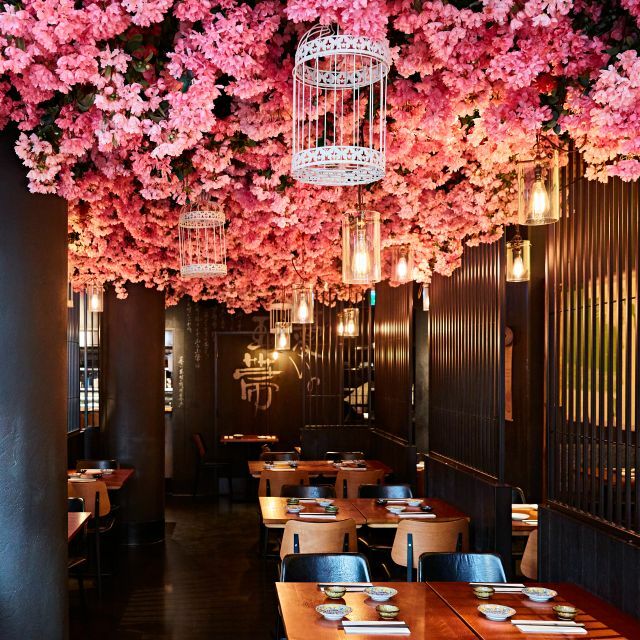 Larger plates include salmon and vegetable poke bowls, assorted donburi rice bowls, and gozen bento sets served in a traditional kaiseki tray with steamed white koshihikari rice, wafu salada, tofu and wakame miso soup. 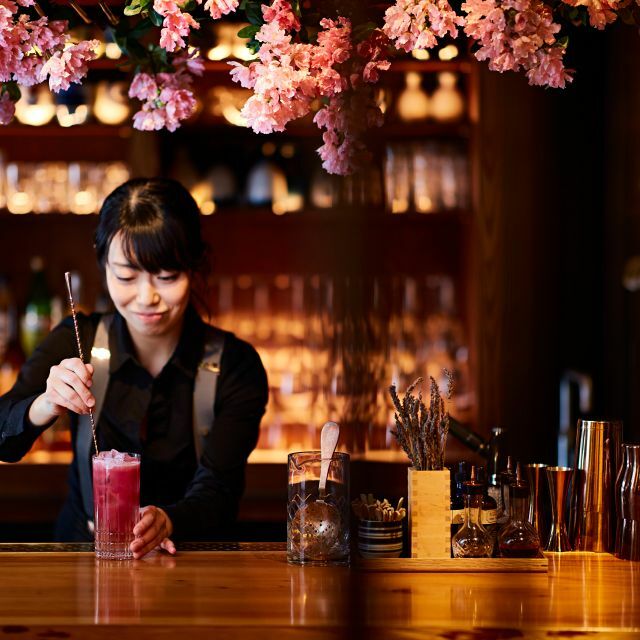 Sake is king at Sakagura, choose from a wide selection of sake from some of the best artisan breweries in Japan or get fruity with our unique range of Japanese inspired sake cocktails. We also have a great selection of virgin cocktails and soft drinks. Our yakiniku meat is wet aged in specialist Japanese kuraban fridges for extra tender texture & flavours. How would you like your yakiniku? 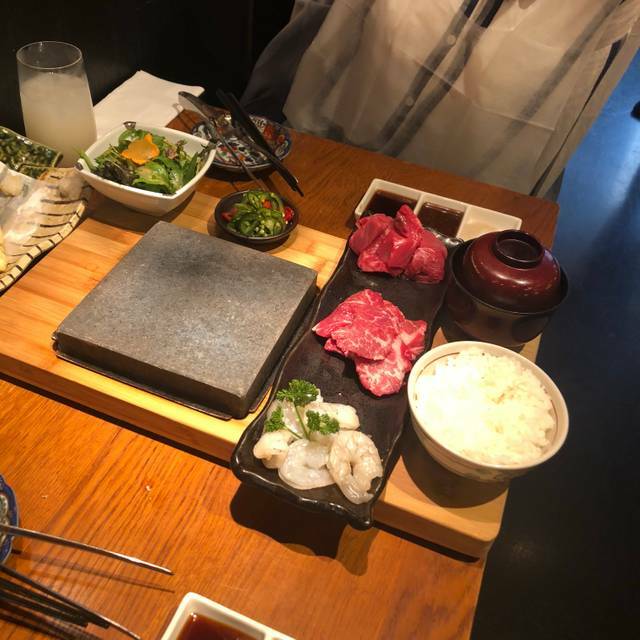 Charcoal Barbeque (Terrace or Sumibi Floor) or Lava Stone or Grill Table (Sumibi Floor. Bookings only. T&C's apply. Please note, the Yakiniku stone barbecue is not availible at the bar seating. 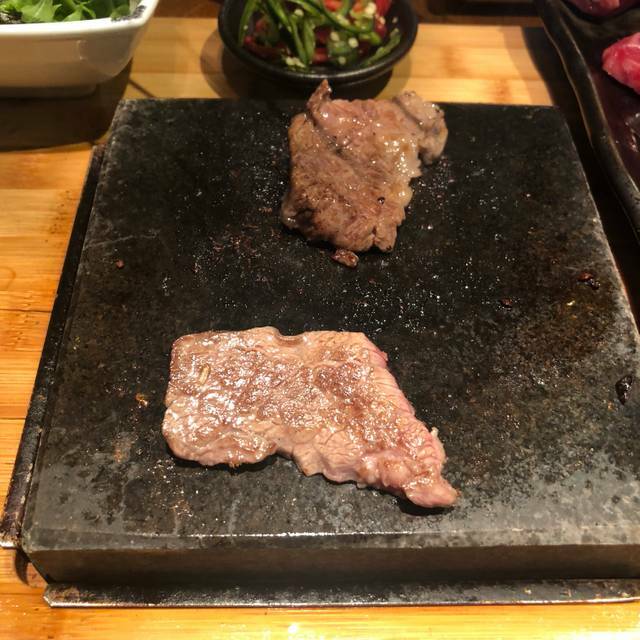 Your steak comes on a hot lava stone, heated to 400°C, it will be piping hot all the way from start to finish. Choose how you like your steak, from rare, medium to well-done, & grill away! Share the steak with the table with our Japanese sharing plates. And that's ishiyaki style! 3 courses and unlimited champagne, Japanese Bloody Mary or House Wine. $60 per person. If you choose to order the Bottomless Brunch menu, this must be taken by all guests at the table. Unlimited drinks will be served for 1.5 hours only. One glass at a time will be served to each guest. Need something more substantial for lunch? Have a touch of luxury and grab a mate for 2 Australian Wagyu Stone Steak lunch sets for £80 every Monday and Tuesday from 12 - 3pm. Complete with Japanese inspired steak sauce, a choice of side and green salad. 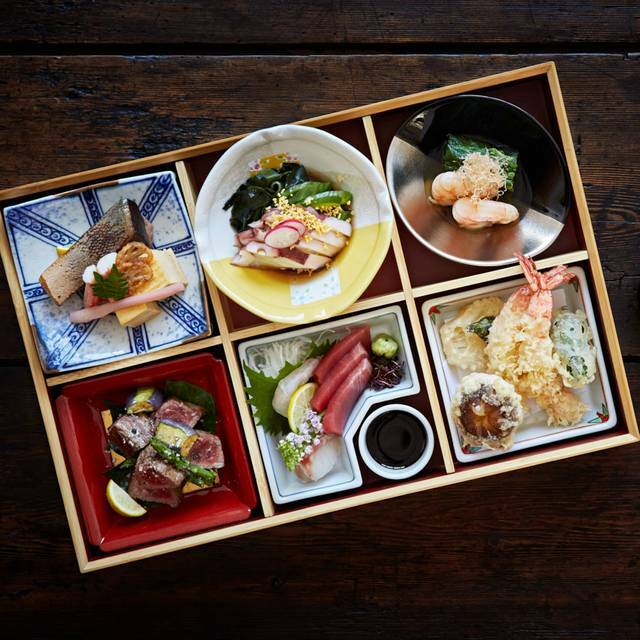 Served in a traditional kaiseki bento box, our beautifully balanced bentos are perfect for busy office lunches or just catching up with friends. With a choice between meat, fish and vegetarian boxes, everyone is happy! Delicious bento box with incredible attention to detail. 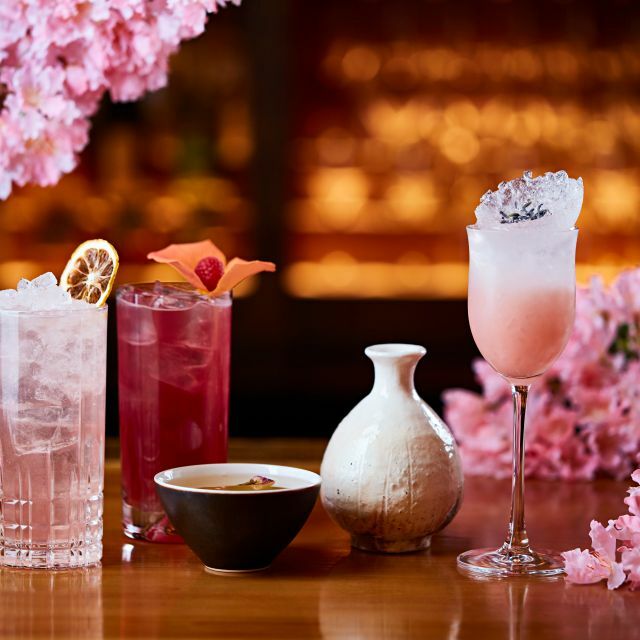 Cocktails were good, and the cherry blossom was a lovely touch. Staff very welcoming and food was good value for its standard. Would recommend! The food is really great. Sushi was fresh and delicious, tempura was amazing and must try the pork gyoza. Even the mochi ice cream for dessert was delicious. Servers could have been slightly more attentive. Be prepared to pay £100+ for two diners with 1 or 2 drinks each. 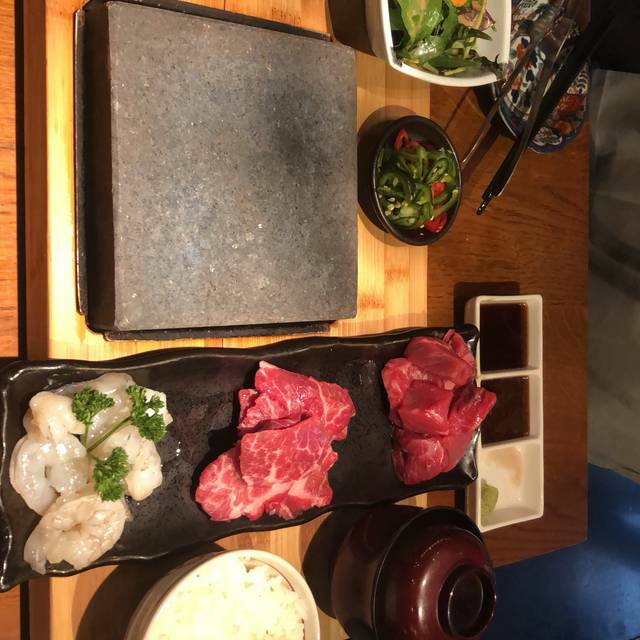 The food is nice, especially the Yakka Tofu and the stone steak. People work there are polite and willing to discribe how the food and drinks will be. Will come again! hope they will keep the good quality and service. Disgusting sushi. Huge portions, sticky gross rice. Horrible service, food took around an hour to arrive. Only good thing is their big sake collection. Awesome food! Reminded us of a Kyoto isakaya. Highly recommended! good food ， but not satisfied with the service.I paid in cash ，but the waiter counted wrong and wanna charge me 50 pounds more. It was awesome. Delicious food, great service. Food quality was as good as it gets. The drinks were a bit underwhelming though. Service was fine. But the price tag is understandably high because of the location etc. Will I come back? I’ll have to think twice though. All food there was perfect even for Japanese tongue. Sushi of nigiri and roll was one of the bests in Europe I think. Performance of Robata steak was good as well. The first time we went to Sakagura it was amazing, so i decided to come back here for my partners birthday and i must say that the service was not as great as the first time, it took a good while for our drinks to come and we had to wait a long time for the bill. Also we ordered our food in the order we wanted the food to come to us..what we would have for starters mains etc, the waitress said it wouldn't be a problem but all of the food came in the wrong order, i think for the money you pay it shouldn't be a problem receiving the food in the order you want, if it was going to be a issue then we should of been told that. The first time we came to Sakagura we didn't have this issue. Overall the food was nice and it is a nice place to eat, but we feel we had better service the first time we went. Food is special and the selection of Sake is fantastic. We had multiple servers and think we got lost as the service was extremely slow from taking orders, to food arriving, to having to ask for the bill which then turned out to be incorrect. Not worth the money. The saki and sashimi were great, but the rest was average. Absolutely delicious like in Japan !! Large choice of sake ! Not a good value, particularly for the level of service received. The waiter seemed high as a kite and uninterested in being there that night. Sushi was OK, nothing special. We had Great food at lunch, unfriendly service. Did not feel welcomed. 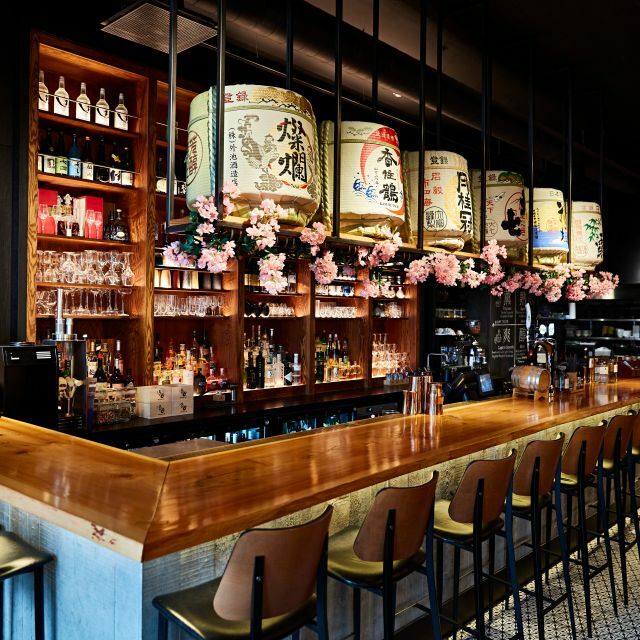 Great food, excellent service and a whopping great Sake selection. Excellent lunch on the bottomless brunch menu. Fourth time here and the quality is still very high. I love this place, but we ordered food and it took an incredibly long time to arrive, only coming after we asked the server. This made me think they must have lost our order, but noone apologized for the delay. Then, when the food arrived it contained shrimp even though we had ordered without because a member of our party was allergic. Again, noone really apologized. Other than than, it was a nice evening, but for the price (very expensive) we would have expected a little more. Foods are very good taste. Many Sake are seerved here. Everything’s perfect, Friendly staff, various sake I can choose, fresh sashimi. Sakagura’s a one of restaurants I stronly recommend to my friends. It's a great place for both business and casual meetings. Have been there with business partners, candidates for a job and family. Staff is friendly and don't mind extra wishes. I love this place and I always visit. Everything is lovely! Admittedly, it’s a little bit on the pricey side, but worth it. I gave it 4 stars on food because they have changed the recipe of the sweet potato fries, which isn’t so great now. But everything else is wonderful! The food was amazing but the staff acted uninterested all night. Took us 15 minutes to get a menu and 45 for drinks. Too bad the service ruined the experience for us because the food was quite memorable. Would recommend , though would say it is 15 % overpriced. The tiramisu dessert was delicious and would have been superb if the cake would have been somewhat modere dredged with sake, as the menu promises. Oh and the seating closer to the door was giving us cold from the draft. One of my favorite meals in London so far! We had the Chilli squid, the spicy tuna roll, pork belly and then a steak to cook ourselves. Everything was delicious. The only issue I had was that the food came out almost altogether so i sent back the food that we wasn't ready for. If you book here make sure you have the smoked whiskey sake for a post dinner drink.... was outstanding! It was quite nice but not great. We dined at 1:30pm on a weekday and the restaurant was about half-full. Tables for two are very small and feel a bit peripheral. Service was polite and friendly but inattentive: I had to chase for our G I returned it and took salmon instead, which was much better. The tempura prawns were lovely: big, juicy and flavoursome, and the miso soup was excellent. The room gets pretty smoky when diners cook steaks on hot stones. I love the food and the choice of two menus really either the steak or the sushi but the price is up there. I would not go back for sushi but I would like to try the steak. The food and service was excellent and whilst I accept the service charge is automatically added to the food bill I do not expect to have a further 12.5% service charge added to a drinks bill for an after meal drink sitting at the bar. This was obviously optional as there was no question when I mentioned I was not happy paying it but it still left me feeling upset as i don't like complaining.